After so many camping trips, I have arrived at an important conclusion. You can’t immensely enjoy the trip without good food. And by that, I mean grilled beefsteaks and grilled sausages. With the advent of portable grills, having good food after a long day hiking and running isn’t hard anymore. However, the real quest is to find the most suitable one. If you have been looking for the best portable grills for RV for family camping, here are top 11 items should be on your shopping list. For over 17 years, Coleman has built up a business empire with reliable outdoor gears and equipment. Coleman RoadTrip LXE Portable Propane Grill is one of their best products for family camping trips. The Coleman offers many valuable features. With two burners, you can prepare for two dishes at the same time. Steaks on one burner and burgers on the other. The burners are also heat-adjustable. This allows you to cook different food on the same grill with two separated temperature zones. The Coleman grill starts without matches or lighters thanks to the Instastart knob. The cooking area is over 280 square inches, which is ideal if you want to cook a big meal. The burners supply 20,000 BTUs of grilling capacity. With one propane cylinder, the grill can work more than one hour. Coleman’s grilling grates are fully cast-ironed. The coating makes the grates super durable. The surface is also cleanable, making the after-meal scouring less daunting. I highly value this model’s portability. It isn’t as lightweight as other items below. However, its foldable stand and a set of wheels are game-changing factors. This way, users can easily carry the equipment around. The low-profile lid and compact design allow the model to be the best companion for truck and car drivers. It certainly doesn’t eat up space. This product is stress-free when it comes to setting up. The Coleman guideline includes only four steps. The Coleman RoadTrip LXE Portable Propane Grill comes with two side tables. Cooking will be much more comfortable with all the spies, tongs and spatula beside. The tables can be slide in and out. The top lid provides an ideal environment for the food to be cooked. As the heat distributes evenly throughout the cooking surface, it takes less time to prepare. If you find the LXE is a bit too small, the model LXX should be a better option. Providing 22,000 BTUs of grilling power over 285 square inches, the Coleman RoadTrip LXX Portable Propane Grill is undoubtedly the most trusted friend for camping, picnic, and backyard grilling parties. Though the model comes with wheels to increase the portability, it also has one drawback. The wheels can’t be locked, so it sometimes moves when you are cooking. I think it would be better if the wheels are fixed in one position. The Coleman RoadTrip LXE Portable Propane Grill is indeed versatile outdoor equipment with a myriad of handy features. It is suitable for a big family camping trip with cars on weekends. Another grill comes from the prominent Coleman. Coleman Sportster Propane Grill is an average-size grilling machine with loads of practical features. The product offers a grilling area of 225 square inches. The maximum grilling capacity is 11, 000 BTUs. Compared to the LXE above, it is quite small. I think it would be an excellent choice for a small-size family picnic and camping. The model is compatible with a 16 oz propane tank. This allows the grill to function for more than one hour. On the other hand, the limited cooking surface makes the Coleman Sportster a space-saver model. Its compact design with lower lid fits into most trucks and cars. Coleman Sportster offers ultimate transportability. This model is surprisingly lightweight. It is only 25 lbs. What’s more, it comes with a collapsible wheel kit and a handle. This is the highlight of this model. Thanks to the secured and balanced stand, the grill is reliable. You don’t have to worry if the wheels will move as they do with the LXE. The grill lock functions correctly. Attached to the foldable stand, the lock offers a stable cooking surface. The Coleman Sportster comes with a drip tray to collect and store grease, oil from cooking. You can remove it from the grill and clean it up after use. I particularly like the lock-up feature that secures the lid during transport. The rugged latch ensures that the lid won’t open during transportation. The grates, made of porcelain-coated steel, are durable and easy to remove. You can quickly clean the interior elements. The drawback is quite trivial. I find the grates are quite thin. It doesn’t affect the food quality, but the thin grates seem flimsy and look less durable than that of other products. I highly recommend the Coleman Sportster Propane Grill for a simple family camping trip. Those who ask for nothing but a basic and reasonably-priced grill should choose this item. 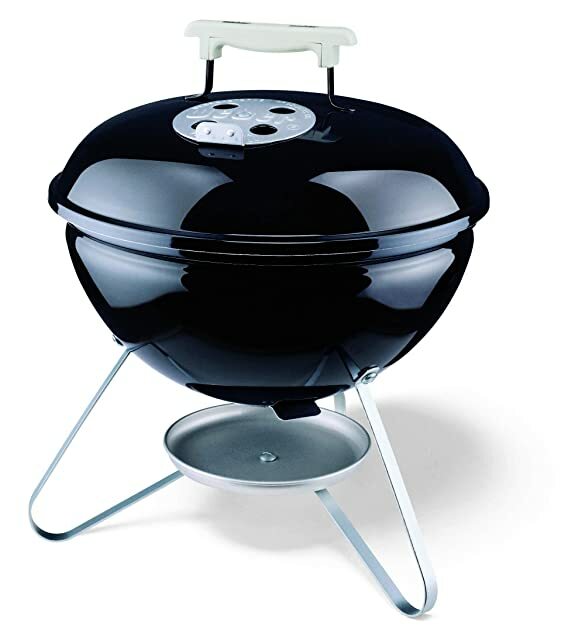 The Weber 50060001 Q1000 Liquid Propane Grill is a high-end product with loads of premium features. 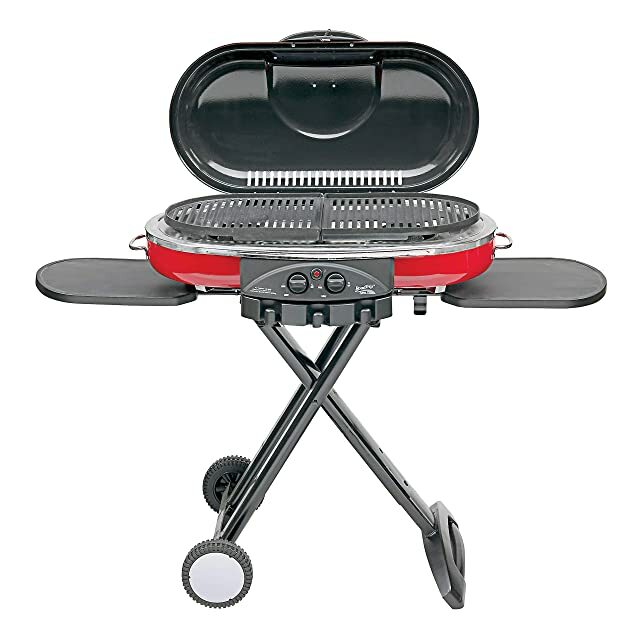 As you can see, the Weber Q1000 doesn’t offer foldable stand and wheels as the two models above. If you prefer portable grills with wheels and handles, the Weber may not be a suitable option. However, the Weber is an excellent choice for family camping thanks to its excellent features. 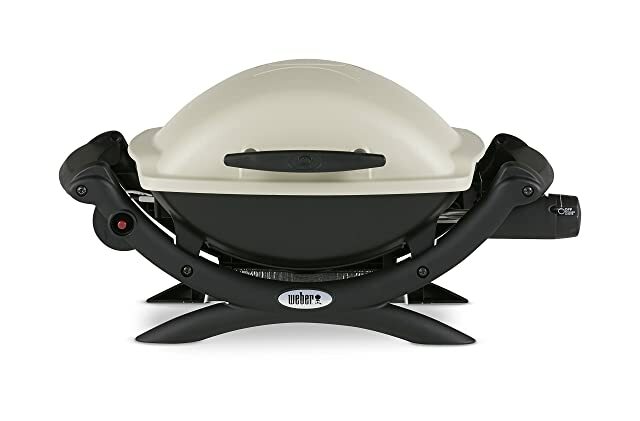 Since the Weber doesn’t stand tall, your family can sit on the ground while grilling beefsteaks or keeping an eye on hamburgers. Everybody shares a part in creating a delicious meal. I prefer this way. The Q1000 comes with a stable parallel base. It offers a reliable cooking area, eliminating any chances it would fall over. The total cooking surface is 189 square inches. Its one burner delivers up to 8500 BTUs to grill vegetables, beef, and meat. The stove is made of stainless steel – a durable and robust material. Compared to other models, the Weber is quite small. It is more suitable for small-size parties and camping trips. The compact design counteracts for the limited cooking space. The full dimensions when lid closed is 14.5 x 27 x 16.5 inches. I find this is ideal dimensions for versatile cooking equipment. It certainly doesn’t require much space in your RV car. Another useful feature to name is the glass-reinforced nylon frame. The Q1000 uses fiberglass to intensify the temperature generated by gas. The quick ignition causes no delay in cooking. You need no match or lighter for this process. The grates are both cast-ironed and porcelain-enameled. The porcelain-enameled is for industrial purpose rather than the artistic one. The thin layer of ceramic will protect the grates from chemical and physical damage. Both the lid and body are cast aluminum. The material is famous for being durable and erosion-resistant. The model comes with a removable drip tray. The Weber also offers an exclusive combo with competitive price. You can either buy a grill with adaptor hose or a thermometer instead. The drawback is that this product isn’t compatible with 16 oz LP cylinder as the manufacturer guarantees. This is quite a disappointment. 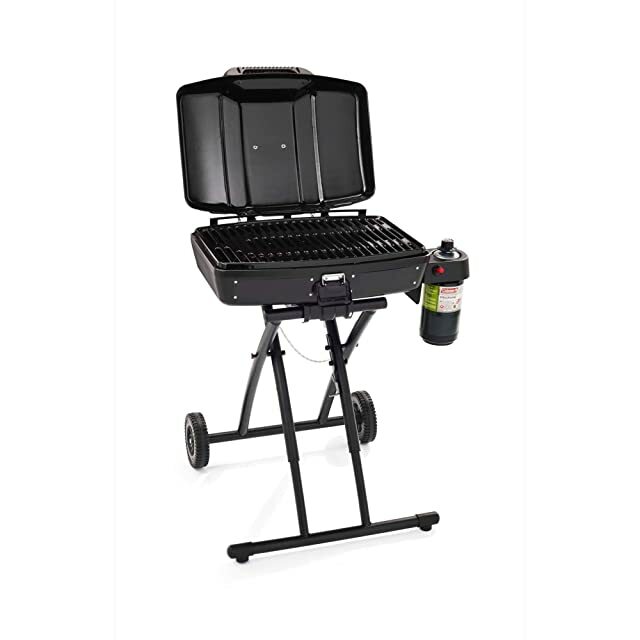 Weber 50060001 Q1000 Liquid Propane Grill offers a great size product for traveling and camping. Small-size families would consider this model for their upcoming trips. 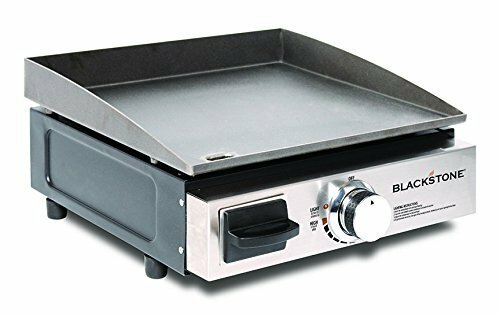 Blackstone Table Top Grill offers a simple and classic option for fans of grilling food. As for the portability, this model is surprisingly lightweight. It is only 25 lbs, an ideal weight to carry around. Though the Blackstone doesn’t come with foldable stand and wheels, it offers a tabletop design. The grill removes the heavy grates, which is a big plus for the portability. Blackstone uses a griddle to replace conventional grates. I love it just because it is super easy to store and clean. You can remove the grill and wipe it with paper after cooking. After that, put it upside down atop the body to save space. There are drawbacks of a tabletop grill. Most of them fail to deliver an ideal cooking surface. But with this model of Blackstone, the cooking area is 260 square inches (15.25 x 17 inches). For this large cooking surface, the grill can handle up to 9 burgers, 12 eggs and so on over its steel surface. I bet it is enough for a decent outdoor camping meal. If you want a bigger cooking area, consider the 22-inch model. It comes with a 330 square-inch surface. I think that both 17-inch and 22-inch offer enough space to cook for family outings. If you invite lots of people, the cooking time would be extended. However, that doesn’t compromise the quality of grilled food. This 17-inch model features a convenient 1-lb propane container. It adopts piezoelectric igniter, making the cooking process convenient. The single H-shaped burner distributes heat evenly throughout the surface, even the sides, front, and back. During your cooking time, oil and grease will be stored in a slide-out tray. The stray is situated in the front, which is accessible. Both tray and grill top is easy to clean. You need to wipe the grill top out with paper carefully and flip it upside down to save space. You can also purchase a carrying bag to store and transport the grill. What Blackstone needs to improve is the size of the grease tray. It should be more prominent, I suppose. If you make nine burgers, 12 eggs for a meal and more, you need a large grease tray for sure. I am delighted with the simple design of Blackstone Table Top Grill. Those who seek classic yet useful kitchen equipment for medium-size family camping trips should consider this item. 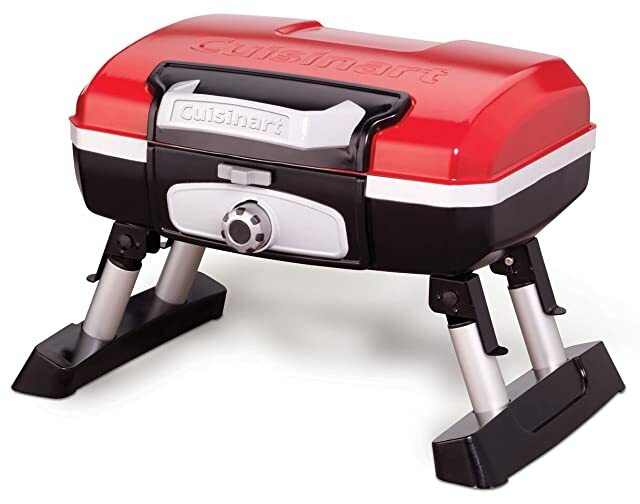 As the name suggests, Cuisinart CGG-180T Petit Gourmet Portable Tabletop Gas Grill isn’t a large item. That could make this grill less appealing for those who want a cooking equipment for lots of people. However, if you only need a small, portable piece for easy-going outdoor trips, this is the best choice for you. Featuring a 145-square-inch cooking table, this little guy can handle quite an impressive numbers of foods. 8 burgers, 8 steaks, up to 10 chicken breasts and so on! You can certainly feed your hungry camping mates with that much. This piece comes fully assembled. That means once you unbox, the grill is ready to work. After settling down for a meal, I would love to start cooking instantly, not spending extra minutes to assemble the equipment. The model features foldable stands, which deliver a somewhat reliable cooking surface. The stands, however, aren’t very much supportive. I still feel like the grill could fall over. For those who love a simple tabletop grill, you can fold the stands up. I particularly like the briefcase design with a handle and lid lock. Weighing only 17 lbs, the Cuisinart CGG-180T Petit Gourmet is exceptionally portable. The grill has a 5,500 BTU burner over 145 square-inch cooking area. Cuisinart also offers a versa-stand model with a slightly larger cooking surface of 160 square inches. While the CGG-180T Petit Gourmet isn’t an ideal option for heavy-duty grilling, it is a compact and portable grill for small-size camping and tailgating trips. 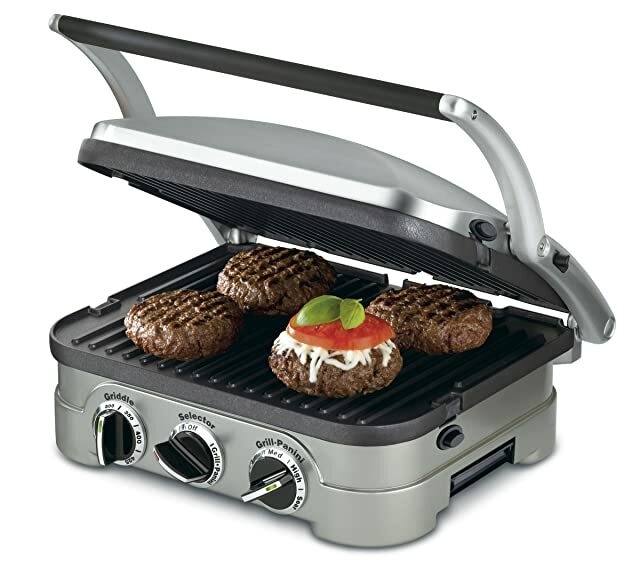 Cuisinart GR-4N 5-in-1 Griddler is an extremely versatile item with loads of useful features. The name says it all. This model from Cuisinart offers 5-in-1 use. The first option is to close the lid. This way, you can cook from chicken to beefsteak without risking losing too much moisture. The second option is the full grill. When you have a sizeable hungry party, you certainly need a bigger grilling surface. By doubling the cooking surface, from 100 to 200 square inches, the GR-4N is now able to handle over 12 servings. You can also use the full-griddle option to fry eggs, make pancakes and bacon. Another choice is to use half-half, which means grilling on one plate and griddling on the other. The last option is to use it as a panini press, perfect for making burgers, bread or quesadillas. I have to say there are few small grills that could do what the GR-4N can. It could make your simple camping trip into a big grilling fest. Cooking is always side by side with cleaning. With the GR-4N 5-in-1, even the most daunting task turns to be easy. The cooking plates with the nonstick surface are either removable and cleanable. The after-cook grease will be stored in a dip tray for disposal. This product from Cuisinart emphasizes the ease of use. With three different selectors, it is easy to choose between functions and temperatures. There is a light to show you if the griller has reached the desired heat. This product comes with a compact and lovely design. It features a long U-shaped handle to make sure that you won’t get burns from the heat. Now what I don’t like about this item is its plastic buttons that support the grill plates. I don’t think they are durable. I have already read a few complaints about them being breakable. But I guess that doesn’t happen to everyone. All in all, I’m very much confident about the Cuisinart GR-4N 5-in-1 Griddler. It is handy, maneuverable, versatile, and portable. That would make a perfect grill for a camping trip with lots of people. George Foreman is a prominent name in the world of grills. Lots of campers favor this model of theirs for many reasons. The grill offers a cooking area of 240 square inches. In the list, it has the second largest grilling surface. With this amount of space, the George Foreman can deliver over 15 servings. Be it steaks, hamburgers, veggies, sausages or eggs; it can handle them well. This is a great option when there are lots of people joining the trip. The George Foreman can easily feed a large party with ease. This electric grill comes with top-notch features for both indoor and outdoor use. First is the George Touch Nonstick Coating. This surface eliminates the common problem of sticky leftovers. Plus, it is super easy to clean and durable. 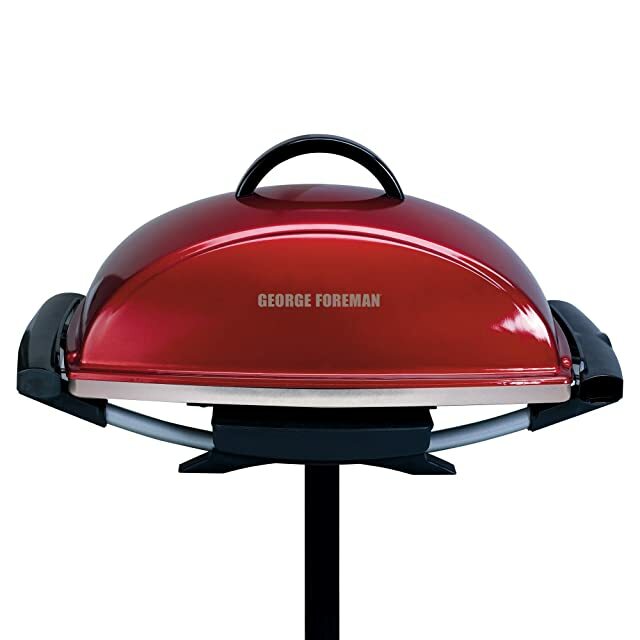 Second, the George Foreman 15-Serving Indoor/Outdoor Electric Grill offers a removable stand. It is highly versatile since you can switch between patio and countertop instantly. Another highlight is a feature to adjust the temperature. It includes five heat settings, which are compatible with different kinds of food. This model comes with a drip tray to collect grease and excessive oil from cooking. What’s more, the grates feature fat-removing slope, which retains less butter and oil on the surface. Undoubtedly it lessens the cleaning process. If you come back from a one-day camping trip, using this electric grill at home to celebrate after the journey is a great idea. There is one problem with the cord though. I find it a bit short. If the grill isn’t right next to the power outlet, I always need an extension cord. George Foreman 15-Serving Indoor/Outdoor Electric Grill is indeed a perfect choice for big family camping trips. Its generous servings and ease of cleaning will bring much joy for users. This George Foreman GFO201RX Indoor/Outdoor Electric Grill comes from the same manufacturer with the model above, yet offers features for different use. The grill delivers a 200-square-inch cooking surface. It is smaller than the model above. As a result, the servings are also less. It can handle up to 12 servings of different kinds, from hamburgers, steaks to sausages. This is still an impressive number because the servings are enough for a big get-together. As for the grates, the surface is covered by the George Tough Nonstick coating. It helps the grates stay durable for a long time. Plus, it makes sure that excess oil and butter don’t stay long. Thus, the cleaning is simple. What impresses me the most is the fat-removing slope. George Foreman guarantees that the slope can reduce 42% of fat while grilling. Isn’t it good? You can eat loads of cooked food without the greasy feeling. The GFO201RX offers a plug-in heat control probe. It allows you to adjust the temperature suitable for different kinds of food. 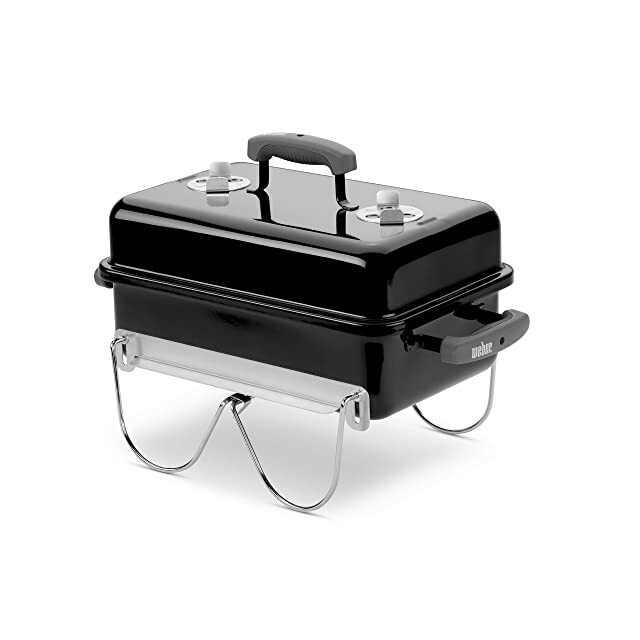 Similar to the 15-servings grill above, this model also has a removable stand. This is an ideal option for RV campers. When the weather gets bad, we can move the grill inside and enjoy cozy meals. Dip tray is available for excess grease. What concerns me is the base, which is a bit too small for the grill. The size of this model is also problematic since it doesn’t fill small-size sinks. I do believe that the George Foreman GFO201RX Indoor/Outdoor Electric Grill is the best choice for campers and RV users. It can be used both indoor and outdoor for large get-togethers. With over 66 years of experience with grills and cooking equipment, Weber is a reliable brand. I find their 10020 Smokey Joe 14-inch portable grill is a product of value. The 10020 has two significant advantages compared to other charcoal, gas and electric counterparts. First of all, it is highly transportable. The dimensions of 15.6 x 15.6 x 9 inches reduce the overall weight. It is less than 10 lbs – the most lightweight model in the list of charcoal grills. What’s more, this product is affordable. Campers on a tight budget love it since they can buy a reasonably priced with full of useful features. The 10020 offers a smoking plate of 14 ½ inches in diameter. It provides a large cooking surface of 147 square inches. You can cook up to 6 burgers, and a few medium-sized steaks together. If you still need a bigger grill, consider the Weber 1211001 Jumbo Joe 18-Inch Portable Grill. It comes with 240 square inches of grilling area, which is enough for a big party. Both bowl and lid are coated with porcelain-enamel. This material is rust-resistant. It is also famous for heat regulating. The built-in dampers also take credits for distributing heat evenly. These aluminum dampers are rust-proof. They work on a simple mechanism. They help prevent unevenly grilled food, which is common in charcoal grills. You adjust the dampers or vents to add or reduce the flow of air. The grill features glass reinforced nylon handles that don’t absorb heat. So your hands are safe from burns and injuries from cooking. What I like best about the fire chimney starter. It is such a convenient feature. It lessens the discouraging task of starting a fire. It brings the burning charcoal to the ideal stage much quicker. Down below is a catcher that helps store after-cook ashes. It is also rust-proof. Weber is confident about the durability of this product. Thus, the grill comes with a 10-year warranty. Dimensions (in) 17" X 14.2" X 14.5"
If you are looking for a small-size grill for a family outing, the 10020 Smokey Joe 14-inch portable grill is certainly a great choice. With its affordability and transportability, it certainly can bring much joy to your grilling parties. BEAU JARDIN charcoal grill offers not only great affordability but also many useful features. The bowl and lid are both porcelain-enameled. The coating enables the container to retain heat while preventing the underneath steel from rust and fading. The temperature remains evenly throughout the grates, ensuring perfect grilled food. Thanks to the aluminum air control vent, users can keep heat under control without using the lid too frequently. The grate comes with two handles, making it easier for you to lift. The grates of plated steel are built to endure charcoal flame and stay usable for a long time. Inside the lid, there is a hanger, which you can use to hang on the bowl handle. It is beneficial because I don’t have to put the lid on the ground anymore. When it comes to cleaning, the BEAU JARDIN charcoal grill is a great relief. The ashtray and ash leak underneath create an instant cleaning system. After all the ash comes down to the tray, your task is to dispose of it and clean the plate for the next use. 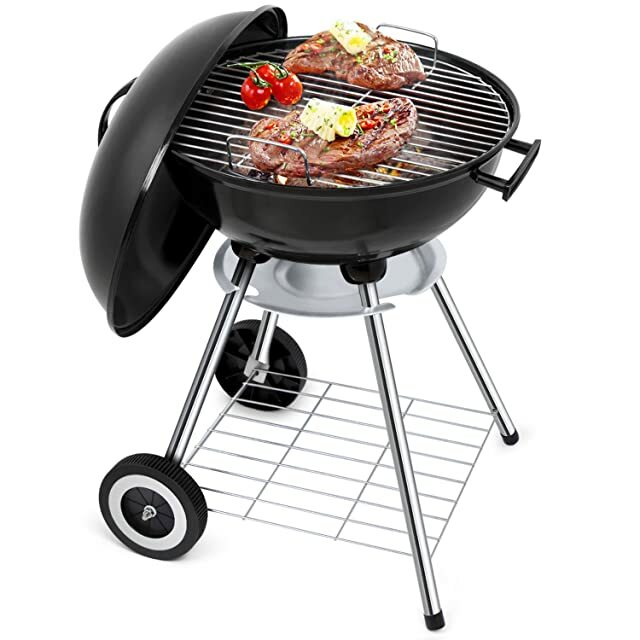 As for transportability, this charcoal grill offers a set of wheels and two legs. I find the legs are a little bit unstable. The model weighs over 10 lbs. Offering a 17-inch diameter of cooking space, the BEAU JARDIN delivers an ample size for any popular grilled food, from burgers, hotdogs to steaks. 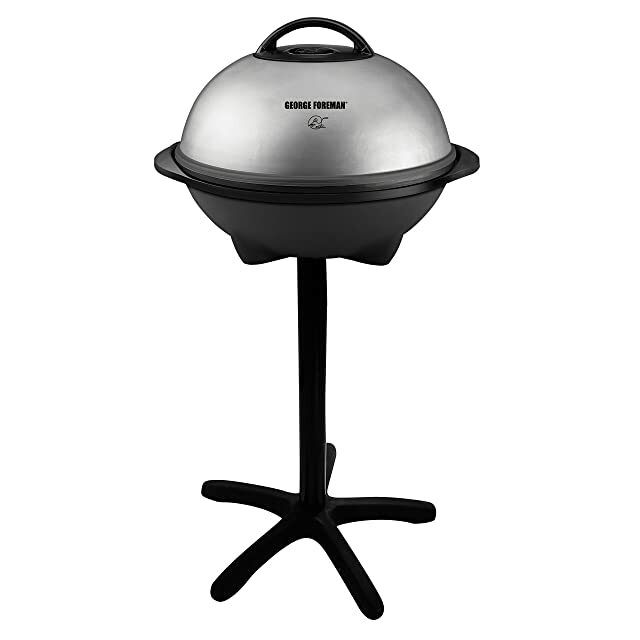 The last item in the list – Weber 121020 Go-Anywhere Charcoal Grill offers a unique rectangular shape. Those who don’t like the round shape of conventional charcoal grills would love this design. This model emphasizes portability. With the dimensions of 12.2 x 21 x 14.5 in, it is perfectly small and compact. The rectangular shape doesn’t eat up too much space. It weighs about 14 lbs, which is slightly heavier than I expect. Weber 121020 isn’t a grill for big party. Family size of 3 to 4 people would be well-fed by this item. The 160-square-inch cooking area allows it to handle up to 4 hamburgers, a few medium-sized steaks, and eggs. The gates function correctly, keeping and distributing heat evenly with powerful air-flow. Setting up and cooking with charcoal certainly takes more time than with gas or electricity. However, the result does pay off. This charcoal grill makes an excellent smoky flavor. What makes Weber 121020 stands out from the rest is the plated steel legs. The legs offer an excellent locking feature that creates a stable surface for cooking. When you finish, simple swing it up to save space. The handle is made of glass-reinforced nylon, which doesn’t absorb heat during the grilling process. The model even comes with two modifiable dampers to control the air flow. The cover is porcelain enameled to avoid rust and fading. I believe that the Weber 121020 Go-Anywhere Charcoal Grill is a perfect option for small-size camping or tailgate trips. Its unique design, versatility as well as portability are top-notch. Do electric grills taste good? Decades ago, the only method for grilling food was charcoal and gas. With the advent of electric grills, it is now easier than ever to enjoy food when the other ways aren’t available. Especially in camping setting, electric grills are the best option. However, there comes another problem: the taste. Many people worry that electric grills are not able to maintain the flavor of grilled food. When it comes to taste, our opinion is divisive. We judge food differently. That’s why it’s hard to generalize about the flavor. We can never come to the same conclusion about what the best and most healthy foods are. For many people, the lack of flame reduces flavors of the food. The taste is merely unfamiliar with what stored in your mind. In other words, the electric grills can’t keep the authenticity of refinement compared to different types of grills. It seems to be a drawback if you have an electric grill in your backyard. However, in the case of camping, electric grills are a good choice. These items allow you to enjoy grilled food even though you don’t have full kitchen equipment. Even though they don’t deliver the same taste as gas or charcoal ones, they are indeed versatile. Infrared grills have been knocking many kitchen’s doors in recent years. They have become favorite kitchen equipment for outdoor use. These products are famous for infrared technology, which is used as the only heat source. Unlike conventional gas products, infrared grills adopt an infrared component between the flame and grates. So now, instead of heating the grates directly, the gas will first warm up the component. Once this part accumulates enough heat, it will then radiates and cooks the food. The history of infrared grills dated back in 1962 when the first burner with the same technology was introduced. At the time, infrared products are mostly used in industrial fields. Some include tire production and automobile paint. Later in the 1980s, a DIY inventor named Best use infrared burner at home to have his barbecue done. For a long time, the technology stayed exclusively for restaurants and fancy steakhouses. Only after when Best’s patent went expired in 2000, home chefs could enjoy the luxury of using infrared burners. The beginning of the 21st century witnessed the fast-growing of commercial and home use of infrared cooking equipment. Many companies introduced new products with affordable prices and useful features. In 2010, roughly 15 million grills were sold only in North America. 80% of those were gas and infrared gas equipment. In recent years, infrared grills and burners have gone through size revolution, so users can bring them along while camping. Are infrared grills better than gas? Infrared and gas grills use entirely different technology. Gas equipment cooks by convection. Convection heats the air inside the grill thanks to the gas flame. The air then distributes evenly over the grates and eventually make the food ready. On the other hand, infrared grills rely much on the heat radiation. The radiation emits infrared waves and directs them to the food. Concerning food quality, infrared grills help to retain more moisture during the process. This is because the air inside doesn’t circulate as much as it does with gas grills. What’s more, infrared grills can generate intense heat, thus making the cooking process faster than gas ones. While gas grills need up to 10 minutes to reach the perfect temperature for cooking, the infrared can do so in 5 minutes. This capability significantly reduces the overall cooking time. How do you use an infrared grill? So how to use an infrared grill? It doesn’t require complicated steps to get this guy worked. Generally, you always need to preheat the grill. This step is crucial because the grates need to be at the right temperature to cook food. As for infrared grills, they take roughly 5 minutes to reach the ideal temperature. Since these items radiate intense heat, they can reduce the cooking time to half compared to other cooking equipment. If you want to master the grilling technique on the infrared, it takes time. This is because these products generate two to three times more heat than that of conventional grills. If you don’t pay attention to the foods, they can turn into ashes quickly. Tenderloins may require 2 or 3 minutes to reach the perfect stage, but asparagus only needs a minute or less. When all the cooking is finished, this is when the real test (for many people) begins. You need to clean the grates and maintain the grill so that your hundreds or thousands of dollar won’t burn away in one use. How long do you grill a steak on an infrared grill? Grilling a perfect tenderloin is any home chefs’ dream. As you have an infrared grill, why not try to learn how it can be done? The perfect beefsteak starts with a flawless cut. You should attentively look for meat with a marbled fat. It should also have the thickness of at least 1 inch. The fat is essential when you grill the meat. It tenderizes the beef while keeping your food juicy. As I mentioned above, you need to bring the infrared grill to the perfect temperature. Fortunately, infrared models can quickly preheat compared to its gas and charcoal counterparts. You need to close the lid for at least 5 minutes. After preheating, place the seasoned beef on the grates for about 2 minutes. Each side should rest with the same amount of time on the grill. This will create the crispy coating and seared marks. After four minutes in total, you now have a perfect piece of rare steak. If you are not a big fan of rare steak, you may want to try medium-rare or medium-done. The steak will ask for about 4 to 7 minutes more to reach this stage. Of course, you don’t need to use the infrared radiation for this step. Simply turn off the gas or electricity, place the beef over the grill and let it cook using indirect heat. For a proper well-done piece, let the beef stay for over 10 minutes. It is super easy with an infrared grill. What you need is to make sure that you don’t overcook the beef. How do you cook a steak on a charcoal grill? There are only two proper ways to maintain the moisture and flavor of beefsteak. Either you use propane or charcoal. So how do you cook a steak on a charcoal grill? First of all, you need to make sure that you have the best charcoal grill. If you still haven’t got a clue, take a look at my review above and pick your favorite one. Next is to choose the steak. When it comes to taste, everything becomes personal. There are many types of steaks, but you need to buy the one you like. If this is your first time grilling steak, ask a butcher for his recommendation. Make sure that you the steak is defrosted before grilling. Season the steak with pepper and salt. Again, it all comes down to personal preference. Prepare the grill. Use enough charcoal to generate heat. Try to make a small heap of charcoal at first. When the charcoals start to be white on edge, you need to even them out. Put the steak over the grill and wait. I can’t give you a specific amount of time. It depends on the temperature, the amount of charcoal and the beef. But don’t worry! Keep your eyes open and listen to the sound of the sizzling steak. After both sides of the beef look seared, close the lid and wait until the smoke comes out. This will give the steak an exclusive smoky flavor. How often should you clean grill grates? I have to admit that cleaning is the least enjoyable part of grilling. However, if you want the grill to last until next time, you must keep it away from grease and dust. The good news is most grills don’t require much of attention. The maintenance is also less daunting than before since grill grates and racks are made of easy-to-clean materials. You certainly don’t have to clean your grill when you don’t use it. But after-use clean is essential. Plus, seasonal cleaning is also crucial as it keeps the grill off dust, thus enhancing the cooking performance. How do you clean ceramic grill grates? Porcelain or ceramic grill grates are quite popular nowadays. The material is famous for retaining heat. It is also rust-resistant. On the other hand, porcelain grates can’t be friends with chips or scraps. Once they appear on the surface, revealing the underneath metal, water can leak in and cause rust. Get yourself a bristle brush and pad. Stay away from bushes of metal or wire since they can quickly bring chips and scraps. I recommend using a rounded head brush because it will make cleaning easier. You can remove any leftovers on the grates quickly when the grill is warm. So the next step is to heat it. Don’t make it too hot. If you overheat the grill, turn the burner off and wait for a couple of minutes. Move the brush along the grates. Make sure the movement is smooth from the top to bottom and vice versa. If you find any sticky leftover on the grates, go over the area a few times gently. Remember not to scrub too hard on the surface. If you find any small area that the brush can’t reach, use a polishing pad instead. The rule of thumb is to clean the grates right after use. This will make sure the function of the grates for the next applications. Can you put BBQ grills in a dishwasher? Of course, you can’t put the whole grill into a dishwasher, but you can put the grates instead if the size allows. Before putting the grates into your dishwasher, you have to eliminate most of the edible debris. The trick is to heat the grates (for gas and electric grills) and let the flame burn out as many leftovers as possible. Let the grates cool down. After that, you should let them rest into warm water and a bit of soap before stuffing it inside the dishwasher. Any massive leftovers or greasy food will cause problems to your dishwashing machine, so be cautious! No one wants to burn their money away with a gas grill that only lasts for a few seasons. When shopping for an item, besides useful features and size, you also need to know if it is built to endure time. There are several contributing factors to the durability of a gas grill. The first thing you need to consider is your investment. Cheap gas grills will not be able to function correctly after a few years. If you only need a grill for that amount of time, then there is no problem. But if you need a durable gas grill that stays with you for years, you need to invest a bit more. You should choose a reliable brand name, and then determine how much you are willing to pay. The second factor is maintenance. Do you keep the grill in good shape? Do you clean it nicely after each use? How about seasonal cleanup? If you say no for all these questions, chances are the grill will not last long. Last but not least, the weather your gas grill exposes to is essential. Steel frames and grates are vulnerable to moisture and water. So if you leave them unnoticed, it will get rusted after a while. It’s hard to tell a fixed time when it comes to durability. As far as I know, sturdy models could stay for over ten years with perfect functions. How do you fix a low grill flame? Low grill flame is just as annoying as not having it at all. Unfortunately, this problem could happen to anyone, at any time no matter how hungry you are. With the Top 11 Best Portable RV Grills above, you don’t have to swim cluelessly in the ocean of choices anymore. Simply take a look at each item’s features and design then determine which one suits you best. Your family outing will be fueled with not only a good time but also great food.